After 9/11, I bought a bought a bunch of extra food and water. I also got some other supplies. After Hurricane Katrina, I doubled my reserves. Then, like many Americans, I slowly let my guard down. I still have food and water, but I have no clue what happened to my flashlight or first aid kit. The threat from terrorism is still real as is the threat from a natural or economic disaster. I needed to be reminded of this. 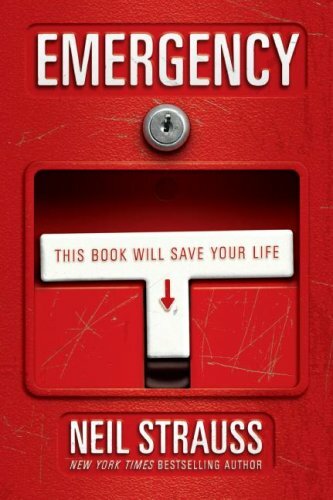 Emergency: This Book Will Save Your Life by Neil Strauss is not a guide, but a story of one man that decided he wants to survive no matter what the world throws at him. Strauss buries himself in the different survivalist subcultures to learn the skills and actions required for survival. I think Neil Strauss is a great writer and I went through the 400+ pages in just a few days. My survival philosophy has always been modeled after my favorite joke. This book made me realize that I can’t run as fast as I thought I could. I have some work to do. Previous Stop For Me – It’s the Claw! Added to my reading list. I’ve always considered survivalists fringe-nutjobs but after 9/11 and the current financial meltdown you’d have to be a fool to not at least briefly ponder how fragile the state of things can be. You will like this book then. The author comes at the subject with the exact same attitude. Come on, aren’t we over-reacting a bit. What is the real chance of becoming a victim of a terrorist attack, let alone one that would require survival skills? Very close to zero. Same with natural disasters and especially economic “meltdown.” Remember that Katrina’s suffering was in part due to government incompetence and mass citizen stupidity. I haven’t read Mr. Strauss’s book and I am sure it has some good tips on surviving extreme circumstances. But you would probably have a better chance of surviving by avoiding the real dangers in life, like crossing the street or driving in a car. Katrina taught us not to trust the government to protect us and our families when the sh*t hits the fan. My community in San Diego was evacuated for wildfires in 2003 and 2007. I had a friend who had 20 minutes to get his family, including an elderly grandma, out before his home was burned down. Bad things can happen. Nothing wrong with being a little prepared. I bought this book at 10 PM last night. I finished it by 4 AM on my flight to the east coast. Damn good book. The saddest part is that in dedicating yourself to reaching that level of training it takes years out of your life. Imagine if Shakespeare was learning how to hunt and fish instead of writing Hamlet. Imagine, if Newton was so afraid of starving or global collapse he didn’t invent calculus.